On the latest episode of WWE 205 Live, Rich Swann defeated Drew Gulak’s friend and tag team partner Tony Nese, gaining crucial momentum before he battles Gulak on Raw to decide who will challenge WWE Cruiserweight Champion Enzo Amore. Set to face Cedric Alexander following his incredible Fatal 4-Way victory on Raw, Drew Gulak – in possession of Enzo Amore’s microphone and acting as the interim conductor of The Zo Train while The Certified G is overseas – recapped his win on Raw and prepared to discuss leadership in the form of a PowerPoint Presentation! Cedric had no desire to see Gulak’s latest PowerPoint slides and entered the ring, ready for a fight. However, Gulak left the ring and explained to Alexander that his first slide would have dealt with leaders delegating. As a result, Gulak revealed that Noam Dar would take his place against Alexander. Not only looking to impress WWE Cruiserweight Champion, but “Drewtopia” as well, The Scottish Supernova aimed to regain his own momentum by defeating his longtime rival. Providing commentary from ringside, Gulak analyzed Dar’s role in The Zo Train, encouraged his ally and taunted Alexander all at the same time. This allowed The Scottish Supernova to shift momentum in his favor and use his technical abilities to keep the agile Alexander on defense. The history between Dar and Alexander certainly played a factor in the match, as they countered each other back and forth, neither gaining a true advantage. Trying to seize on one of his counters, Dar quickly ascended the ropes to perform a high-risk move, but Gulak yelled at The Scottish Supernova, reminding him that Drew Gulak’s WWE 205 Live is a No Fly Zone. Listening to the interim Zo Train conductor backfired for The Scottish Supernova, as Alexander recovered and executed the Neutralizer followed by his patented Lumbar Check for the win. Earlier in the evening, The Brian Kendrick revealed the reason why he attacked Kalisto last week: The Man with a Plan is upset Kalisto walked into the Cruiserweight division and had Championship opportunities while Superstars like Kendrick and Gallagher are cast aside. With their sights set on Gran Metalik, Kendrick and Gallagher would prefer Kalisto not return from his trip overseas. Poised to defend his friend and fellow luchador’s honor, Gran Metalik wasted little time taking the fight right to The Man with a Plan as Gentleman Jack Gallagher watched helplessly from ringside. Kendrick had no answers for Metalik’s offensive maneuvering and struggled to take control of the contest. As the battle spilled to the outside, Metalik executed an incredible leaping hurricanrana over the barricade and seemed to have the match well in hand. However, with the official distracted, Gallagher struck, knocking Metalik off the ropes and giving The Man with a Plan the reprieve he needed. Kendrick timed his strikes to induce maximum punishment, but his pace would give Metalik time to recover and nearly secure victory with a sequence of near-falls. Attempting to stop Metalik in his tracks, Kendrick attempted Sliced Bread No. 2, but the lucha sensation countered. Thinking quickly, The Man with a Plan drove Metalik into the ring post and unleashed a flurry of knee strikes before applying The Captain’s Hook for the win. Drew Gulak hoped that his friend and tag team partner Tony Nese would do enough damage to soften Rich Swann before their upcoming battle on Raw. Gulak accompanied The Premier Athlete, ready to do whatever was needed to gain an advantage against Swann. 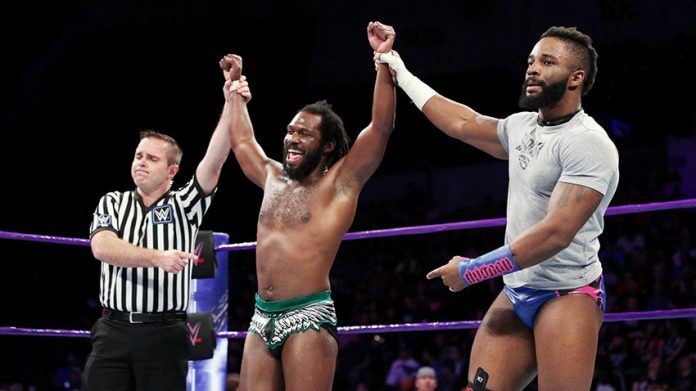 However, the former WWE Cruiserweight Champion didn’t come to WWE 205 Live alone, as his own friend and tag team partner Cedric Alexander accompanied Swann. With evened odds and the match underway, Nese and Swann battled back and forth in and out of the ring as Alexander did his best to keep Drew Gulak away from the action. With Swann’s speed working in his favor, Nese leveraged his own raw power to keep his opponent grounded and prevent any counter attempts. Even with underhanded assists from Gulak, The Premier Athlete seemed to have an answer for every move Swann made. Showing his resilience, Swann moved away from a high-risk move and battled back, with the two Superstars shifting momentum back and forth with near-falls and high-impact strikes. After countering a flurry of kicks from The Premier Athlete with a boot of his own, Swann seized the moment and ascended the ropes before successfully executing his jaw-dropping Phoenix Splash for the win. Irate over Nese’s loss as Swann and Alexander celebrated, Gulak sounded the alarm on his megaphone, and Noam Dar and Ariya Daivari joined them in surrounding the ring. As The Zo Train prepared to move in, Akira Tozawa and Mustafa Ali came to the aid of Swann and Alexander, forcing The Zo Train to retreat.